Q: How does ‘vaping’ e-cigarettes differ from smoking traditional cigarettes? A: You don’t have to look very far to see that the use of e-cigarettes—a practice known as vaping—is on the rise. Many people see e-cigarettes as a safe alternative to smoking regular cigarettes. So how do the two practices differ? And how are they the same? Unlike regular cigarettes, e-cigarettes do not have tobacco. E-cigarettes are battery powered devices that have a heating element and a cartridge that contains liquid. Puffing on the device heats the liquid, which produces vapour. Compare this to regular cigarettes where puffing burns the tobacco and produces smoke—the big danger for the cigarette smoker and everyone around them—not to mention the tar and carbon monoxide that the smoker inhales. The e-cigarette might seem harmless by comparison but taking a closer look at what’s in the liquid raises other concerns. Like regular cigarettes, many e-liquids contain nicotine, even though nicotine for e-cigarettes is not officially approved in Canada. The liquids often contain other ingredients too, such as propylene glycol (PG), a popular food additive. They also come in hundreds of flavours such as strawberry, root beer and chai tea, which make them very tempting to children and teenagers. The production and sale of e-liquids is not yet closely monitored in Canada, which means they may not always contain the ingredients and proportions listed on the label. What’s more, the e-cigarette industry is still so young that there’s no data on the long-term effects of inhaling e-liquids. A key similarity between the two types of smoking that can’t be ignored is that e-cigarettes mimic regular smoking. Public health officials are now speaking out about the dangers of making smoking acceptable again, a trend that could potentially roll back decades of work achieved by anti-smoking campaigns. E-cigarettes should never be viewed as a better way to start smoking. 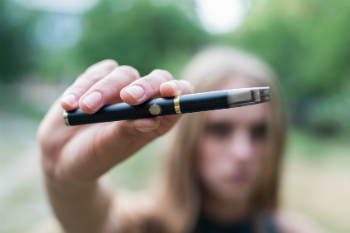 Pediatric specialists all agree that whether it’s e-cigarettes or regular cigarettes, children, teens and adults should never take up smoking under any circumstance.